We’ll never find Atlantis. That’s why we keep looking. That’s why we keep looking for it. This fall, Britain will discover Atlantis. The makers of the television show Merlin are turning the age-old tale of a submerged city into a series (it will be called, unsurprisingly, Atlantis), which is slated to air in the United States in late 2013. But this is only the latest in a long search to find Atlantis. The allegedly “lost” empire has had a hold on us for centuries. How? And, for that matter, why do people keep trying to find it? Before it was a pop culture phenomenon, Atlantis was a legend. It first appeared in writing as a literary device in the Plato dialogues Critias and Timaeus, both of which are among his later writings. In the text, Critias, who, depending on the classics scholar to whom you’re speaking, may or may not be a representation of the historical figure Critias the tyrant, tells of a war that took place 9,000 years before Plato’s writing, between an ancient, land-power version of Athens and Atlantis, the sea power. In Plato’s telling, Atlantis, a city dripping in riches and marked by avarice, loses to virtuous Athens. 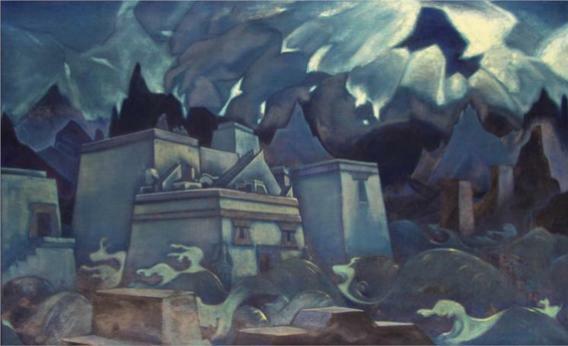 Atlantis was subsequently destroyed by a nasty combination of an earthquake and a flood. At the time of writing, Athens was transforming from the birthplace of democracy into the invader of Sicily and the wager of war. Clearly, there was some sort of message to Athens in all of this, but classics scholars dispute what that message was: To some, it was a warning to democracies not to become overly concerned with military expansion; to others, a lament of the democratization that accompanies building a navy; and to still others, an Athenian origin story. But the Plato story is only the beginning of the Atlantis we now know. Professor emeritus Alan Cameron of Columbia University says that the belief that Atlantis was a place that ever actually existed, as opposed to a literary device, came about around 1492. Whatever was in the air during the age of exploration—the idea that the world was filled with limitless and rich possibilities, there to be discovered by those who dared to look—transformed Atlantis from a Plato myth into a destination for discoverers. There doesn’t seem to have been any one prominent explorer, writer, or scientist championing Atlantis in the 15th century, but, according to writings and recorded conversations from that period, this was the time in which it was reborn in popular consciousness. This was the age, Cameron says, when people really became aware that the world was “enormously larger than they’d ever imagined” and when some began to suppose that Atlantis could be a real place, after all. (Some even thought that Atlantis might have been the Americas, although, as Cameron notes, the problem with that theory is that “they’re still there.”) William Altman, author of Plato the Teacher: The Crisis of the Republic, said that Plato’s story helped make ancient Greeks think of the Mediterranean as just a sea—just one part of an infinitely larger whole. It makes sense, then, that the legend came into new meaning around the discovery of the New World. The transformation never reversed. Pandora’s box (to borrow again from the Greeks) had been opened, and for many, Atlantis would never again exist only in literature. Joe Nickell, an investigator at the Committee for Skeptical Inquiry and Atlantis debunker, says that the story reappeared in the 19th and 20th centuries, and each time Atlantis looked suspiciously less like what Plato described and more like whatever era its new narrator was from. According to Nickell, Ignatius Donnelly’s 1882 work Atlantis: The Antediluvian World depicted a highly sophisticated ancient society, whereas Edgar Cayce’s 1930s Atlantis looked more like a shinier version of his own time. One idea that’s persisted through the ages is that Atlantis was what’s now known as the island of Santorini. That popular theory posits that in referring to the natural disaster that destroyed Atlantis, Plato was actually describing the catastrophe that wiped out Minoan civilization. Richard Ellis, who wrote the book Imagining Atlantis after visiting and researching Santorini, discounts this theory, if only because Santorini is decidedly not under water. A newer idea is that Atlantis was in what’s now southern Spain. Professor Richard Freund of the University of Hartford is the author of the book Digging Through History: Archaeology and Religion From Atlantis to the Holocaust, and in 2011 he led a team on an archaeological expedition to the coast of Spain, over the course of which he believes he found evidence of Atlantis. Indeed, National Geographic turned this into a documentary on Atlantis. Freund argues that it would be bad archaeological practice to discount a literary text as evidence. Still others apply the Atlantis name to searches that have nothing to do with Plato’s story. Part of this is because, as professor Harold Tarrant of Australia’s University of Newcastle explains to me, “it’s the only name we’ve got” that works as such an appealing archaeological marketing technique—hence, “Brazil’s Atlantis,” which has nothing to do with the ancient legend and was discovered in May of this year. Nickell concurs that scientists are “willing to use a metaphor from fiction or fantasy” to popularize their findings and give them an air of mystery. Nickell says that those who look for Atlantis and encourage others to do the same are just stirring up mystery. Which is, for Atlantis-bound adventurers, the whole point: People love mysteries and the idea that they can be the ones to solve them. If Atlantis could be anywhere, that means it can be everywhere. If anyone could stumble upon the true Atlantis, then everyone can. Tarrant doesn’t necessarily believe that’s such a bad thing. It gets people underwater, exploring. And anyway, myths were always supposed to be malleable, to be passed down and changed and shaped by whatever time in which they were told. More from Slate’s series on the future of exploration: Is the ocean the real final frontier, or is manned sea exploration dead? Why are the best meteorites found in Antarctica? Can humans reproduce on interstellar journeys? Why do we celebrate the discovery of new species but keep destroying their homes? Who will win the race to claim the melting Arctic—conservationists or profiteers? Why don’t travelers ditch Yelp and Google in favor of wandering? What can exploring Google’s Ngram Viewer teach us about history? How did a 1961 conference jump-start the serious search for extraterrestrial life? Why are liminal spaces—where urban areas meet nature—so beautiful?